The National Weather Service In Midland Has Issued A * Severe Thunderstorm Warning For... North Central Pecos County In Southwestern Texas... East Central Ward County In Western Texas... Crane County In Western Texas... Southwestern Upton County In Western Texas... ...Read More. The National Weather Service In San Angelo Has Issued A * Severe Thunderstorm Warning For... Southwestern Callahan County In West Central Texas... Northwestern Coleman County In West Central Texas... Southeastern Taylor County In West Central Texas... Northeastern Runnels County In West Central Texas... ...Read More. The National Weather Service In Midland Has Issued A * Severe Thunderstorm Warning For... Southwestern Reeves County In Southwestern Texas... North Central Jeff Davis County In Southwestern Texas... East Central Culberson County In Southwestern Texas... * Until 900 Pm Cdt. ...Read More. The National Weather Service In Midland Has Issued A * Flash Flood Warning For... Northwestern Midland County In Western Texas... * Until 845 Pm Cdt. * At 638 Pm Cdt, Doppler Radar Indicated Thunderstorms Producing Heavy Rain Just South Of Midland International Air And Space Port. ...Read More. A River Flood Warning Remains In Effect For The Trinity River. The Flood Warning Continues For The Trinity River At Riverside * Until Late Friday Night Or Until The Warning Is Canceled. * At 0900 Am Tuesday The Stage Was 133.9 Feet. * Minor Flooding Is Occurring And Minor Flooding Is Forecast. ...Read More. COLLEGE STATION – A former teller at Citizens National Bank has confessed to robbing the bank on the morning of Aug. 1 after law enforcement officials tracked his location through his cell phone. Crockett resident Leon Tai Tran, 20, was taken into custody late Tuesday afternoon in College Station by a variety of law enforcement agencies which included: the Crockett Police Department; the Brazos County Sheriff’s Department, the Department of Public Safety Special Response Team; the Texas Rangers; the College Station Police Department; and the Bryan Police Department. Surveillance was set up on Tran by CPD officers and deputies with the Brazos County’s Sheriff Department “… until arrest and search warrants could be obtained for the suspect Tran and the suspects’ vehicle,” the media statement reported. “Tran was taken into custody without incident at a home on Nelson Road in College Station. Tran was interviewed in College Station by Crockett Police Lt. Clayton Smith and Tran confessed to robbing the Citizen National Bank early this morning (Aug.1),” Cross stated. The investigation is ongoing and evidence is currently being collected tying Tran to the robbery in Crockett, Cross stated. According to CPD Lt. Clayton Smith, the robbery occurred just after 7:30 a.m. on Tuesday, Aug.1 when Tran gained entry into the bank by following an employee inside as she entered the building. “She didn’t see him. Apparently, he snuck in behind her. He had a gun and followed her inside with the gun in her back. He never said anything and just gestured as to which way he wanted them to go. He gathered all the employees together and then put two in the bathroom. He had another employee access the only till that was open and put that in a bag,” Smith said. The police lieutenant said the suspect fled the area on foot and headed in a westerly direction across a field located behind the bank. A perimeter search was initiated around the area of the bank – but by 10 a.m. – the search was called off. Citizens National Bank President Burl Hobson said no one was injured in the robbery and the bank was re-opened at approximately 11:00 a.m.
“We appreciate the assistance from all the local Houston County Agencies that assisted with the response to the bank this morning (Aug. 1) and assistance on the perimeter,” Cross said. The police chief also thanked Texas Department of Criminal Justice officers from the Beto I unit who brought in tracking dogs which helped locate evidence in the field Tran ran through as he made his escape. “Our officers did a great job on this case. We are thankful that no one was physically hurt during this robbery and we are glad to get this suspect off our streets,” Cross stated. Tran graduated from Crockett High School in 2014 and had previously worked as a teller at Citizens National Bank. 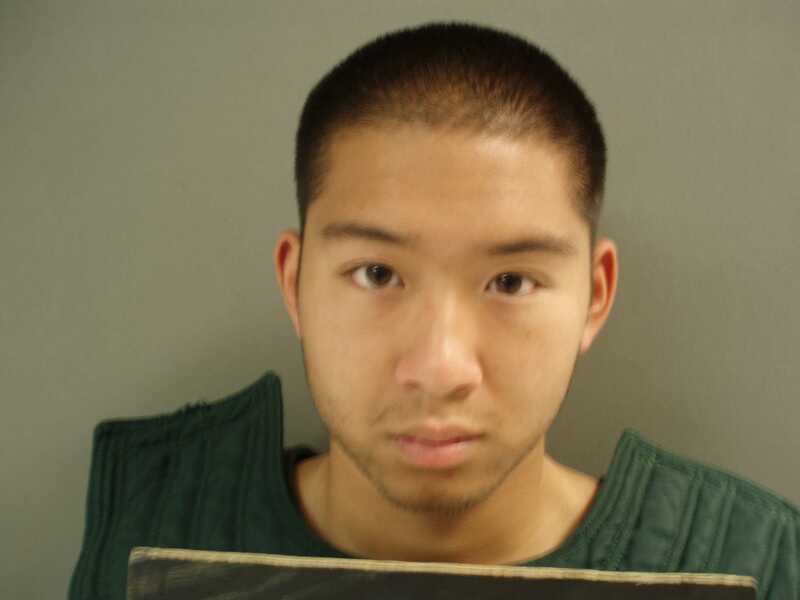 Tran was charged with aggravated robbery and originally held at the Brazos County Jail on a $350,000 bond. He was extradited to Houston County on Aug. 3. Next articleHORACE MCQUEEN: Random Thoughts – For Hot, Dry Days!